This summer the highest lake water temperature we saw near Tomhegan was 75ºF! Nice and warm, the lake was perfect for swimming, tubing and all summer water sports. However, as the temperature has dropped over the past months, the lake has been preparing for its winter freeze. With 7ºF on the morning of December 10th, we knew the lake was going to start freezing in early January. Today, on January 2nd we are experiencing 24ºF, yet it feels more like 18ºF. As the weather gets colder, the water near the surface of the lake cools and becomes more dense. This water sinks and creates a cycle like system that forces warmer water to rise to the top and cooler water to sink. This continues until all the temperature at all depths of the lake reaches 40ºF. Once all the water reaches the same cool temperature, the cycle stops and the surface water continues to cool to 32ºF, which is when we begin to see ice form. Starting on the surface, the ice forms horizontally across the lake, starting with the shoreline. It then grows downward getting thicker as the winter gets colder, making is possible for us to walk, ice fish and snowmobile on it during the peak winter months. 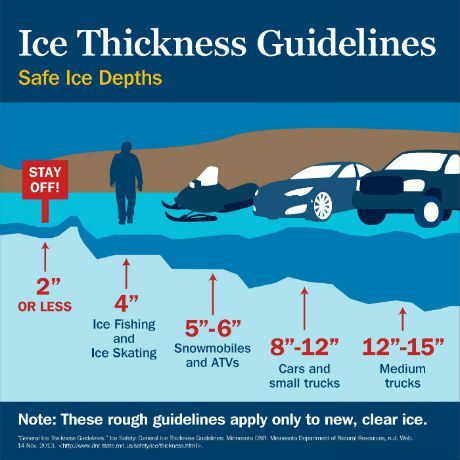 Since Moosehead Lake is so deep (240ft behind Mt. Kineo), the deeper water stays at 40ºF, allowing for the fish to have plenty of swimming space. 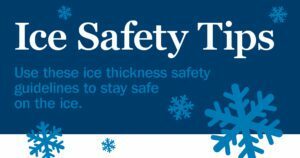 The ice ultimately becomes an insulator, preventing the cold temperatures we experience from removing any more heat from the water underneath the ice. There are some areas on Moosehead Lake that have frozen already. The shallow inlet in Greenville has been frozen on the surface since before Christmas while other shoreline areas have just begun to freeze. Although spanning 40 miles, the lake will freeze quickly with the help of just a few days of consistently cold temperatures. We predict the lake will be frozen this week. What are your predictions for this winter? Please always remember to ask the managers of any soft areas or pressure ridges on the ice to look out for. Safety is our number 1 priority! 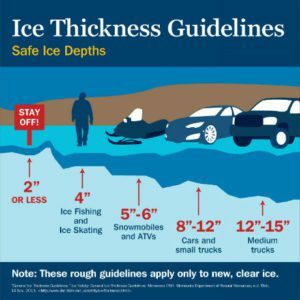 We ask snowmobilers to wait until the ice is at least 5” deep before putting your machine on the ice for both your safety and that of the lakes. 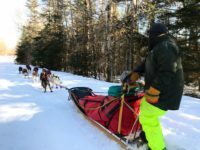 Because we love all of our guests, we kindly ask you to review and abide by all Maine Snowmobile Laws.